Vanitha, the most celebrated family magazine designed for the present generation women has published its latest edition. The 1- 15 July 2014 issue featuring Kavya Madhavan and Ann Augustine is currently available. 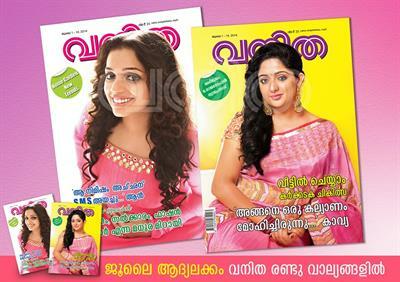 The highlight of July 2014 issue of Vanitha will be the interview of actress Kavya Madhavan. Kavya speaks about her filmy career and marriage dreams in this issue. Kavya Madhavan, the actress who is well liked by the malayali audience opens her mind to the readers telling more on her marriage dreams. Through this interview, Kavya says that she once wanted to get married to somebody living in the Malabar area of Kerala. Kavya reveals her feelings with the readers in an exclusive chat organized by Vanitha magazine. This interview is featured in the Ramzan special issue of Vanitha. This Ramzan special issue has two magazines with one with the cover page of Kavya Madhavan and the other of award winning actress Ann Augustine. The other attractions of this issue of Vanitha are the interesting facts about Malabar and special recipes. Being the Ramzan period, special food prepared by popular chefs and experienced hands finds its place in the July issue of Vanitha. Interesting interviews with former Union Minister O.Rajagopal and his son renounced filmmaker Syamaprasad makes this issue auspicious for reading. Specially arranged talks with Lal Jose, Ann Augustine and Chitra Iyyer would keep the flavour till the end of the last word. Being the monsoon season, a detailed article on Karkkadaka treatment which can be done at home is described for the readers. As the football fever reaches its peak with the next level, special focus on the glamour women in 2014 World Cup would add more colours to the July issue of Vanitha. With a circulation of around 7 lakhs, malayalis cannot miss a single issue of this magazine. Readers who wish to read the current issue can use the e-vanitha section to know more about the features. Articles on kids care, Style & Trendy, Astrology, Travel, and Health can also be found in this issue of Vanitha. Being the most favourite magazine among the family readers, Vanitha is read by celebrities too who do update each issue of this magazine even during their busy schedule. Printed in multi coloured pages, 'Vanitha' designed with perfection it is not strictly a women's magazine but widely read by men also. The magazine at an attractive price tag is affordable for common man.